Trend have introduced a smaller router to their black and silver range. 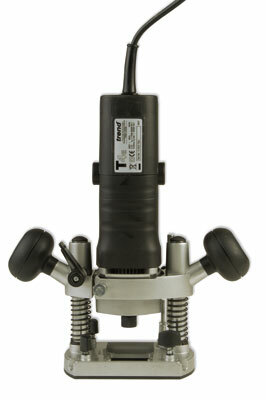 Touted as a 'copy router', the T4E fills a gap at the lower end. Bosch used to sell small 'green' router models which were great for smaller work, and many professionals used them as a machining head in a copy router setup. 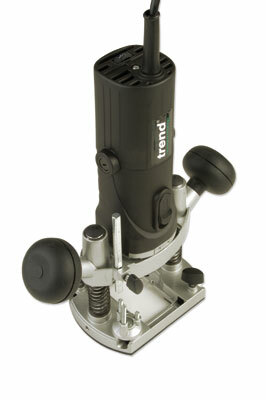 Trend appears to be exploiting the fact that Bosch have dropped them in favour of bigger machines. The T4E even has a Euroneck collar allowing it to slip easily into existing copy setups. The big question is: does it live up to being used as a professional lightweight machine? The design isn't new or different but it is solid and well put together. The motor body is very slim considering it holds a powerful 850W motor. The speed dial is on top, set in the motor vent moulding, with 'min' to 'max' settings and speeds 1-5 in between. The manual has a note stuck to the front advocating the use of speed 5. Trend told me that if the motor were run at 'max' setting for die-grinding work when demounted from the base, it would be doing 32,000rpm which is too fast for routing! The power switch has a flick-off safety feature and the motor brushes are easily accessed from the outside of the casing but shouldn't require attention for a long time. 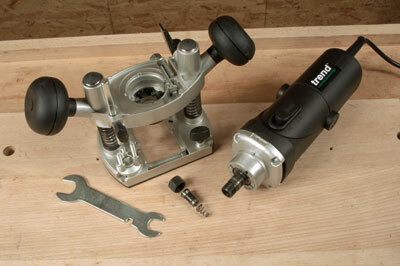 The tough aluminium motor body casting incorporates a spanner-operated body clamp. To remove the motor body the collet nut, collet ejection spring and collet must be taken out to allow the spindle to go through the casting. The spring could easily get lost and the 1/4in collet is rather on the small side for heavy loading. Two 1/4in and one 8mm collets come with the machine. I found removal very difficult as the two aluminium meeting surfaces rubbed together, and I ended up using the palm of my hand to thump each of the grip knobs to persuade the collet to come free little by little. A spot of Vaseline on the Euroneck collar solved the problem. 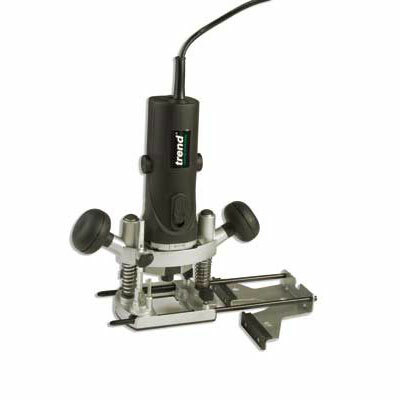 The three-stage depth-setting turret has a snappy twist action but when pressed down hard by the depth rod it cants at a slight angle, thus not giving an absolutely precise cut depth setting each time. The plunge rods, critical for accurate work, have slight play when unlocked but this disappears completely when the lock is put on, making the setup rigid. The springs are external but this doesn't affect performance. The cast base is pleasingly straight-sided, making it easy to run along a straightedge. There are the usual three fence lock knobs with anti-vibration springs. The fence is heavy-gauge pressed steel with long fixed rods. One has a centimetre scale to help adjustment although I don't think it is much use in practice; a steel rule and test cuts are the only way. 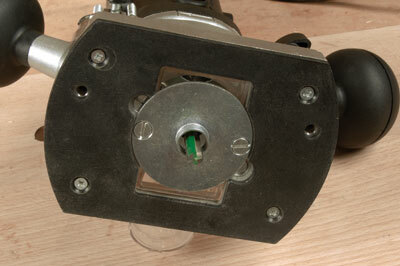 The plastic fence facings are non-adjustable and have a slight upstand which bring up close to the router base. Because the fence was not parallel to the rods the facings were not perpendicular, but a bit of careful bending sorted it out. The plastic facing on the router base is textured and very flat. 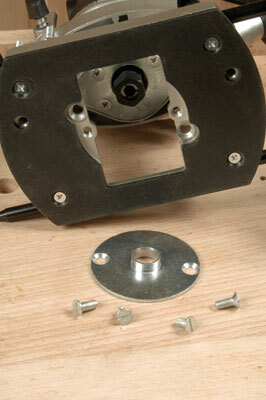 There are two holes for mounting the router in a table or attaching a Unibase, required for the Trend hinge jig. The cutter opening has two sets of holes on either side. One lot are recessed down and intended for the clear plastic snap-together dustspout. The machine screws are barely long enough to hold this in place, and vibration could shake it free and catch the cutter; longer screws would be safer. The other holes take the standard Trend guidebush fitting, a 16mm overall-diameter guidebush being supplied with the T4E. This is a good machine. Capable of the sort of serious work that a T5 or similar would handle, it would do many users as their standard machine. It is let down by the small collet type and the curious injunction not to set a speed above '5', there being apparently no other way of limiting the maximum safe speed for routing, although cutters are normally tested to well above most machines' maximum limits. 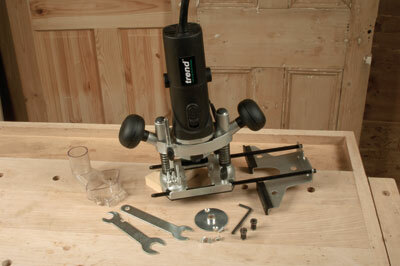 It is a good substitute for the old lamented Bosch POF routers. The T4E should prove to be a worthy successor in the lightweight category. "Does it live up to being used as professional lightweight machine?"